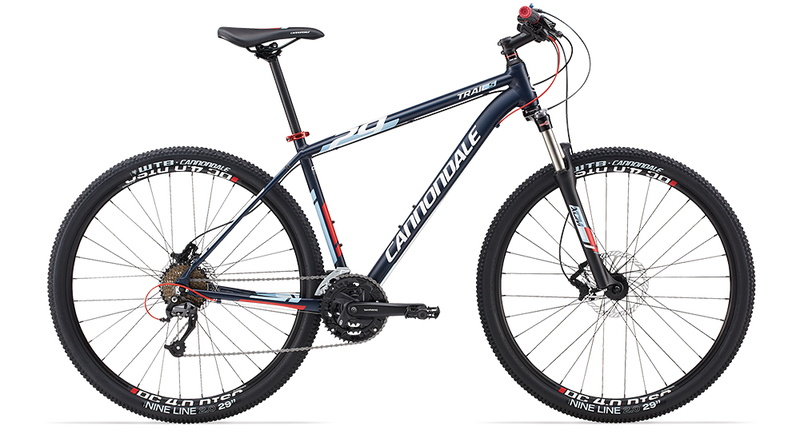 Cannondale pretty much pioneered aluminium frame construction for mountain bikes, and the depth of its expertise in manipulating tubing is evident even on this entry-level hardtail. With its flattened SAVE chainstays and slender seatstays that are designed to work in combination to give a more comfortable ride, the Trail 29 5 frame wouldn’t look out of place in our £1,000 category. There’s a price to pay for that top-notch frame, though; namely a substandard drivetrain and woefully under-powered brakes. Cannondale’s own-brand brakes lack bite and the lever-action is heavy so your hands get doubly worked. The brakes do kick in, but the delay is more than a little unnerving given how fast you can roll with the 29in wheels and the excellent WTB tyres. A riser bar, riser stem and a conical headset spacer pump up the handlebar height on the Cannondale to give it a bit of a sit-up-and-beg riding position. Still, the bike climbs efficiently even with the lofty handlebar, aided, no doubt, by the fact that it’s the lightest 29er in this category. The biggest disappointment in the build kit has to be the cheap, square-taper chainset with its non-replaceable rings. Fortunately, for Cannondale, it’s nothing like as big a deal breaker as a dodgy fork. The Suntour XCM RL is a bit of a pogo stick and sports Suntour’s signature top-out clunk when locked out, but it doesn’t spike and it’s not harsh on the hands when in the open setting. As a result, the Cannondale is one of the faster, more confidence-inspiring bikes in the £600 category.